Every sentence has a purpose, Indeed the purpose of a sentence is to convey a meaning from one person to another. A sentence is made of the parts of speech. In a sentence nouns, pronouns and verbs are three of the most important parts of speech. In this article we will look at the different part of a sentence which is called modifiers. Read the article below to know what are modifiers in English. Modifiers are words or groups of words that add information about the nouns, pronouns and verbs of the sentence. Modifiers add especial meaning to the sentence, they add color, vividness and interest. Modifiers give more information about something else in the sentence, and tell us more about the parts of a sentence. 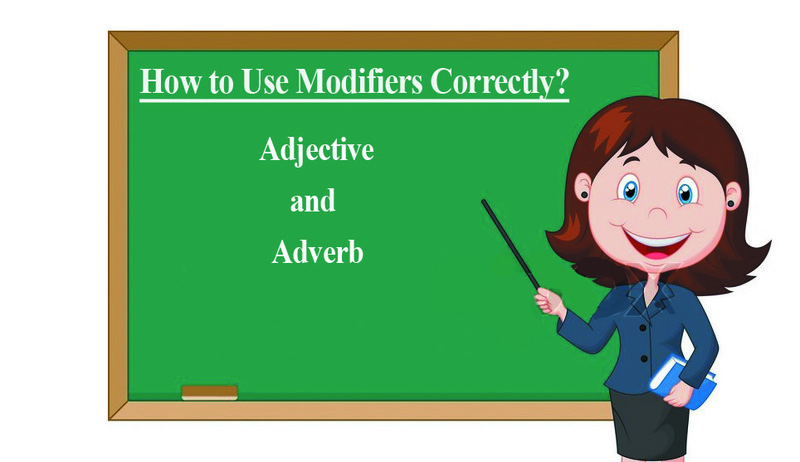 The two most important kinds of modifiers are adjective and adverbs. An adjective modifies or gives more information about a noun or a pronoun appearing in a sentence. Diligent = adjective (gives information or modifies a noun ‘worker’). An adverb modifies a verb, and adjective, or another adverb. Works = verb, She = pronoun = subject , diligently = adverb (gives more information about the verb ‘works). Is = verb = linking verb (a linking verb describes something that a subject is), She = pronoun = subject, diligent = adjective (gives more information about the subject ‘she’). very = adverb (modifies the adjective ‘diligent’). Works = verb = action verb, she = pronoun = subject, diligently = adverb, extremely = adverb (modifies the adverb in the sentence ‘diligently). Which to use an adjective or an adverb? In some sentences in English it can be a little tricky to figure out whether to use an adjective or adverb, here are a couple of rules which will help make it easier. 1. After an action verb, use and adverb. Remember that an action verb describes something that a subject does. Normally after action verbs an adjective is used. 2. After a liking verb, use an adjective. Remember that a linking verb describes the state of being, it tells something that a subject is, rather than something that a subject does. Note: The most common linking verbs in in English is the verb to be but there are many other linking verbs in English: looks, seems, appears, feels, sounds all of these can be a linking verb. Remember these verbs can be used as an action verb, when used as action verb describe what the subject does and when used as linking verb describes what the subject is. The Correct use of “well”. Well is word can be used as an adjective, as an adverb as noun or interjection. Well as an adjective: healthy. Well as an adverb: in a good way. Don’t confuse the adjective ‘well’ with the adjective ‘good’. You look good in your new dress. ‘Badly’ is an adverb, meaning “in a bad way.“ Use it only with an action verb. The accident damaged the car badly. Sometimes a group of words works as a modifier in a sentence, like phrases and clauses. Both phrases and clauses often used as modifiers in sentences, they give more information about something else that appears in the sentence. Running to catch the bus, I tripped on my untied shoelace. (Main verb in the sentence ‘tripped’ and ‘I’ is the subject, ‘running to catch the bus’ is a phrase which gives more information about the subject ‘I’). The food was spoiled because it had been left on the table overnight. (‘The food was spoiled’ is an independent clause, and ‘because it had…….overnight’ is a subordinate clause it cant stand as sentence alone, here the subordinate act as a modifier which gives information about the first clause). 1. When a modifiers is separated from the word or words it modifies, causing confusion, it is called a misplaced modifier. A modifying phrase or clause should be close to the word or words it modifies. Painted bright yellow, the decorator selected a new cabinet for the kitchen. 2. When a modifier has no word or words to modify, it is called a dangling modifier. While driving to work yesterday morning, an accident delayed traffic on the highway. (1) While I was driving to work yesterday morning, an accident delayed traffic on the highway. (2) While driving to work yesterday, I was delayed by an accident on the highway. Now you are expert in using adjectives and adverbs as modifiers, so you should be able to go out and sprinkle your writing with all kinds of lively vivid interesting description using these modifiers correctly and you can do it without fear of making grammatical errors. Don’t forget to comment your feedback blow.